We may never know how much history remains forever unwritten. Of the beginnings of the Idaho camps, there have trickled back into the record only brief, inconsequent, and partial stories. The miners who surged this way and that all through the Sierras, the upper Cascades, north into the Selkirks, and thence back again into the Rockies were a turbulent mob. Having overrun all our mountain ranges, following the earlier trails of the traders and trappers, they now recoiled upon themselves and rolled back eastward to meet the advancing civilization of the westbound rails, caring nothing for history and less for the civilized society in which they formerly had lived. This story of bedlam broken loose, of men gone crazed, by the sudden subversion of all known values and all standards of life, was at first something which had no historian and can be recorded only by way of hearsay stories which do not always tally as to the truth. The mad treasure-hunters of the California mines, restless, insubordinate, incapable of restraint, possessed of the belief that there might be gold elsewhere than in California, and having heard reports of strikes to the north, went hurrying out into the mountains of Oregon and Washington, in a wild stampede, all eager again to engage in the glorious gamble whereby one lucky stroke of the pick a man might be set free of the old limitations of human existence. So the flood of gold-seekers — passing north into the Fraser River country, south again into Oregon and Washington, and across the great desert plains into Nevada and Idaho — made new centers of lurid activity, such as Oro Fino, Florence, and Carson. Then it was that Walla Walla and Lewiston, outfitting points on the western side of the range, found a place upon the maps of the land, such as they were. Before these adventurers, now eastbound and no longer facing west, there arose the vast and formidable mountain ranges which in their time had daunted even the calm minds of Meriwether Lewis and William Clark. But the prospectors and the pack-trains alike penetrated the Salmon River Range. Oro Fino, in Idaho, was old in 1861. The next great strikes were to be made around Florence. Here the indomitable packer from the West, conquering unheard-of difficulties, brought in whiskey, women, pianos, food, mining tools. Naturally, all these commanded fabulous prices. The price for each and all lay underfoot. Man, grown superman, could overleap time itself by a stroke of the pick! What wonder delirium reigned! These events became known in the Mississippi Valley and farther eastward. And now there came hurrying out from the older regions many more hundreds and thousands eager to reach a land not so far as California but reputed to be quite as rich. It was then, as the bull-trains came in from the East, from the head of navigation on the Missouri River, that the western outfitting points of Walla Walla and Lewiston lost their importance. Southward of the Idaho camps, the same sort of story was repeating itself. Nevada had drawn to herself a portion of the wild men of the stampedes. Carson for its day (1859-60) was a capital not unlike the others. Some of its men had come down from the upper fields, some had arrived from the East over the old Santa Fe Trail, and yet others had drifted in from California. All the camps were very much alike. 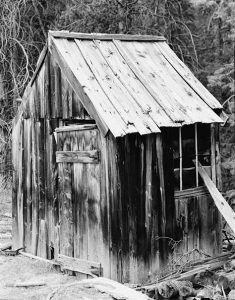 A straggling row of log cabins or huts of motley construction; a few stores so-called, sometimes of logs, or, if a saw-mill was at hand, of rude sawn boards; a number of saloons, each of which customarily also supported a dance-hall; a series of cabins or huts where dwelt individual men, each doing his own cooking and washing; and outside these huts the uptorn earth — such were the camps which dotted the trails of the stampedes across inhospitable deserts and mountain ranges. Church and school were unknown. Law there was none, for of organized society there was none. The women who lived there were unworthy of the name of a woman. The men strode about in the loose dress of the camp, sometimes without waistcoat, sometimes coatless, shod with heavy boots, always armed. If we look for causes contributory to the history of the mining-camp, we shall find one which ordinarily is overlooked — the invention of Colt’s revolving pistol. At the time of the Civil War, though this weapon was not old, yet it had attained very general use throughout the frontier. That was before the day of modern ammunition. The six-shooter of the placer days was of the old cap-and-ball type, heavy, long-barreled, and usually wooden-handled. It was the general ownership of these deadly weapons which caused so much bloodshed in the camps. The revolver in the hands of a tyro is not especially serviceable, but it attained great deadliness in the hands of an expert user. Such a man, naturally of quick nerve reflexes, skillful and accurate in the use of the weapon through long practice, became a dangerous, and for a time an unconquerable, antagonist. It is a curious fact that the great Montana fields were doubly discovered, in part by men coming east from California, and in part by men passing west in search of new gold fields. 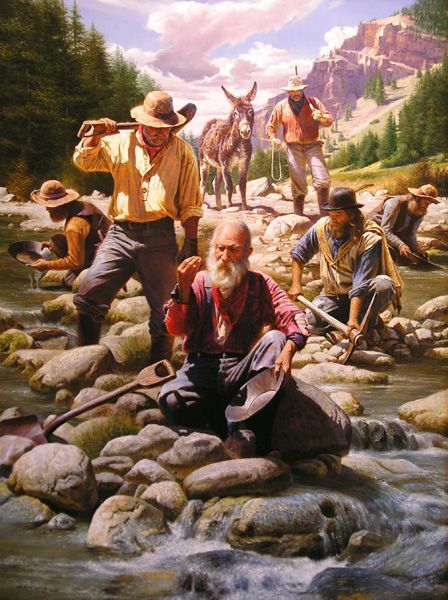 The first discovery of gold in Montana was made on Gold Creek by a half-breed trapper named Francois, better known as Be-net-see. This was in 1852, but the news seems to have lain dormant for a time — naturally enough, for there was small ingress or egress for that wild and unknown country. 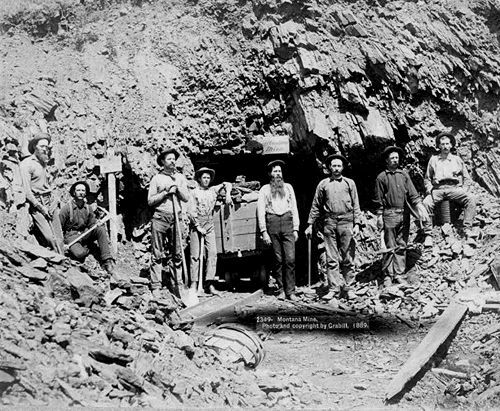 In 1857, however, a party of miners who had wandered down the Big Hole River on their way back east from California decided to look into the Gold Creek discovery, of which they had heard. This party was led by James and Granville Stuart, and among others in the party were Jake Meeks, Robert Hereford, Robert Dempsey, John W. Powell, John M. Jacobs, Thomas Adams, and some others. These men did some work on Gold Creek in 1858, but seem not to have struck it very rich, and to have withdrawn to Fort Bridger in Utah until the autumn of 1860. Then a prospector by the name of Tom Golddigger turned up at Bridger with additional stories of creeks to the north, so that there was a gradual straggling back toward Gold Creek and other gulches. This prospector had been all over the Alder Gulch, which would prove to be fabulously rich.